Most people associate grits with butter but grits are also delicious and creamy when made with olive oil. 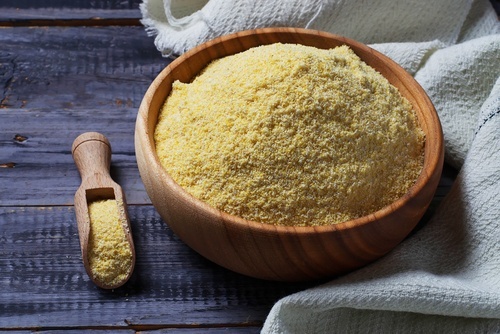 Depending on who you ask, grits are similar or identical to Italian polenta. Both are made from ground cornmeal slow cooked over a low flame. Here is a recipe that we adapted from the Courier Journal. In a heavy-bottomed pot bring the milk, water and salt to a simmer. Lower the heat and whisk in the cornmeal. Cook for one hour, stirring often. Keep some hot water on hand in case the mixture becomes too thick. Add water as needed to thin the texture of the grits. Before serving, stir in 1/2 cup of cream and 1/2 cup of extra virgin olive oil. You can dress up grits with Parmesan cheese or herbs to suit your recipe. You can serve the grits as a side dish or you can make a full meal out of it by topping the grits with a fried egg. Yum!